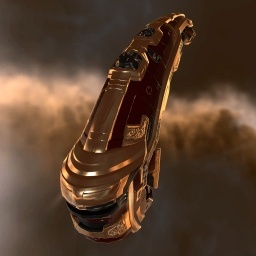 The Deacon is the latest success from the engineers at Carthum Conglomerate, designed as a remote repairing ship that can keep up with fast moving fleets including those containing the extremely popular Confessor-class Tactical Destroyer. Managing to miniaturize the powerful remote armor repairing systems from their best-selling Guardian Logistics Cruiser onto a frigate-sized hull was no simple task, but Carthum was able to release the Deacon in nearly record time and under-budget thanks in part to extensive cooperation with researchers from the Lai Dai megacorp. Carthum ships are the very embodiment of the Amarrian warfare philosophy. Possessing sturdy armor and advanced weapons systems, they provide a nice mix of offense and defense. On the other hand, their electronics and shield systems tend to be rather limited. You can write a summary for the Deacon here. Further information about additional or recommended skills to pilot the Deacon for a specific or its common role(s) can be written here. Make sure to maintain distance from hostiles: web hostiles by DDs or jam by EWars to help speed tanking the incoming damage. You can add any notes on tactics here. You can write additional notes for the Deacon here. This page was last modified on 31 May 2017, at 21:27.